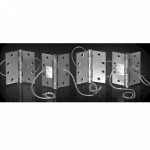 TA2714 1104 McKinney Hinge Electrified By ACSI - 4 Wire - 4-1/2" x 4-1/2"
The McKinney TA2714 1104 Hinge is a 4-1/2” x 4-1/2” ACSI Electrified 4 Wire Hinge. 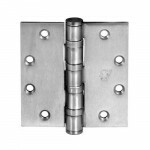 Through Wire ..
TA2314 McKinney Hinge - 4-1/2" x 4-1/2"
The McKinney TA2314 is a 4-1/2” x 4-1/2” Full Mortise Standard Weight Ball Bearing Hinge with stainl..
T4A3386 NRP McKinney Hinge - 5" x 4-1/2"
The McKinney T4A3386 NRP is a 5” x 4-1/2” Non-Removable Pin Full Mortise Heavy Weight Ball Bearing H..
T4A3386 NRP McKinney Hinge - 4-1/2" x 4-1/2"
The McKinney T4A3386 NRP is a 4-1/2” x 4-1/2” Non-Removable Pin Full Mortise Heavy Weight Ball Beari..
T2714 NRP McKinney Hinge - 4-1/2" x 4-1/2"
The McKinney T2714 NRP is a 4-1/2” x 4-1/2” Non-Removable Pin Full Mortise Standard Weight Plain Bea..
1502 McKinney Spring Hinge - 4-1/2" x 4-1/2"
The McKinney 1502 is a 4-1/2” x 4-1/2” Full Mortise Spring Hinge with steel base material polished a..
T4A3786 NRP McKinney Hinge - 5" x 4-1/2"
The McKinney T4A3786 NRP is a 5” x 4-1/2” Non-Removable Pin Full Mortise Heavy Weight Ball Bearing H..
TA2714 1108 McKinney Hinge Electrified By ACSI - 8 Wire - 4-1/2" x 4-1/2"
The McKinney TA2714 1108 Hinge is a 4-1/2” x 4-1/2” ACSI Electrified 8 Wire Hinge. 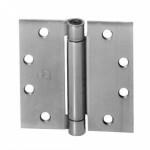 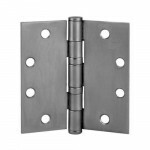 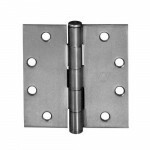 Through Wire ..
T2714 McKinney Hinge - 4-1/2" x 4-1/2"
McKinney T2714 is a 4-1/2” x 4-1/2” Full Mortise Standard Weight Plain Bearing Hinge with steel base..
TA2314 NRP McKinney Hinge - 4-1/2" x 4-1/2"
The McKinney TA2314 NRP is a 4-1/2” x 4-1/2” Non-Removable Pin Full Mortise Standard Weight Ball Bea..
TA2714 McKinney Hinge - 4-1/2" x 4-1/2"
The McKinney TA2714 is a 4-1/2” x 4-1/2” Full Mortise Standard Weight Ball Bearing Hinge with steel ..
TA2714 NRP McKinney Hinge - 4-1/2" x 4-1/2"
The McKinney TA2714 NRP is a 4-1/2” x 4-1/2” Non-Removable Pin Full Mortise Standard Weight Ball Bea..
T4A3786 McKinney Hinge - 4-1/2" x 4-1/2"
The McKinney T4A3786 is a 4-1/2” x 4-1/2” Full Mortise Heavy Weight Ball Bearing Hinge with Steel ma..
T4A3786 NRP McKinney Hinge - 4-1/2" x 4-1/2"
The McKinney T4A3786 NRP is a 4-1/2” x 4-1/2” Non-Removable Pin Full Mortise Heavy Weight Ball Beari..
T4A3386 McKinney Hinge - 4-1/2" x 4-1/2"
The McKinney T4A3386 is a 4-1/2” x 4-1/2” Full Mortise Heavy Weight Ball Bearing Hinge with stainles..